Haloumi is the king of cheeses, but add a golden coating and a drizzle of honey and it’s beyond belief! These gorgeous morsels are served on a robust salad of dukkah roasted pumpkin, fresh veggies and vibrant mint for a seasonal and satisfying delight. Preheat the oven to 220°C/200°C fan-forced. 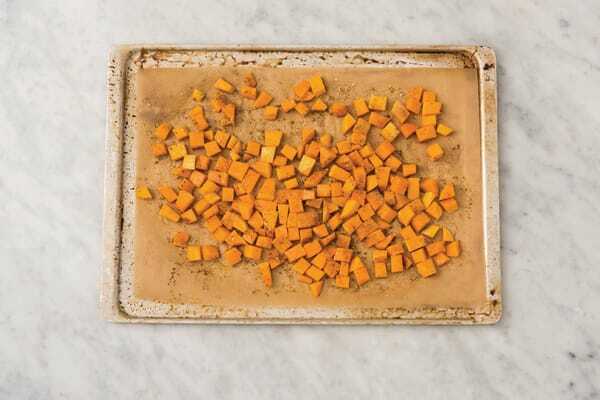 Place the peeled & chopped pumpkin, dukkah and a drizzle of olive oil onto the oven tray lined with baking paper. Toss to coat, then roast for 20-25 minutes or until tender. 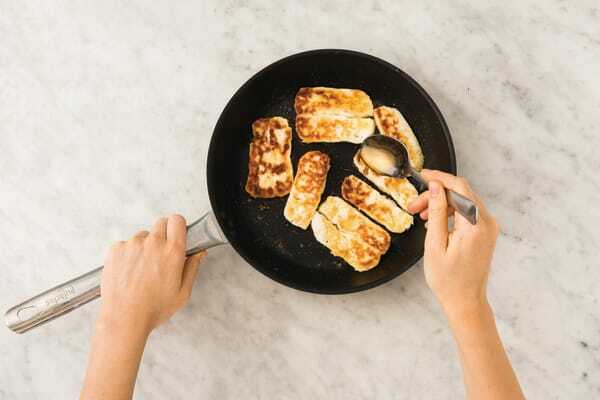 While the pumpkin is roasting, cut the haloumi into 1cm-thick slices. 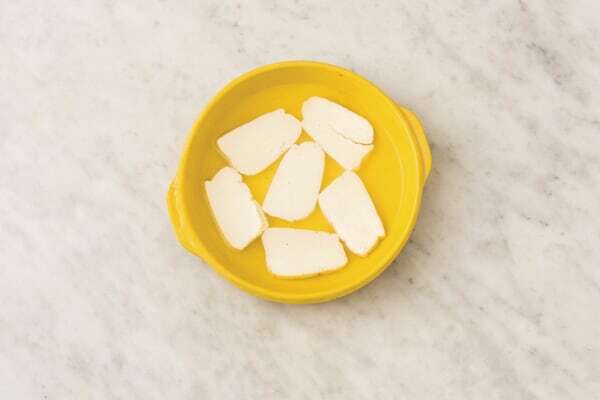 Place the haloumi slices in a small bowl of cold water and set aside to soak for 5 minutes. Thinly slice the tomato into wedges. Thinly slice the cucumber into half-moons. Pick the mint leaves and thinly slice (reserve a few leaves for garnish!). 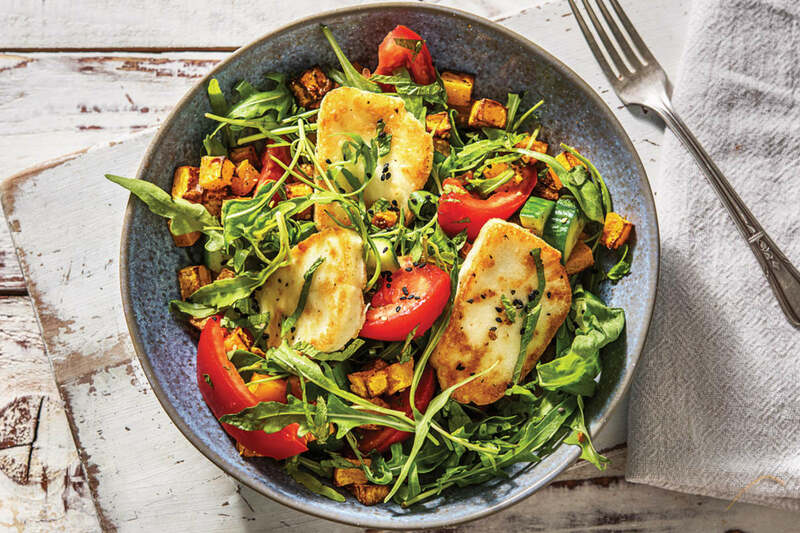 TIP: Soaking the haloumi helps mellow out the saltiness. 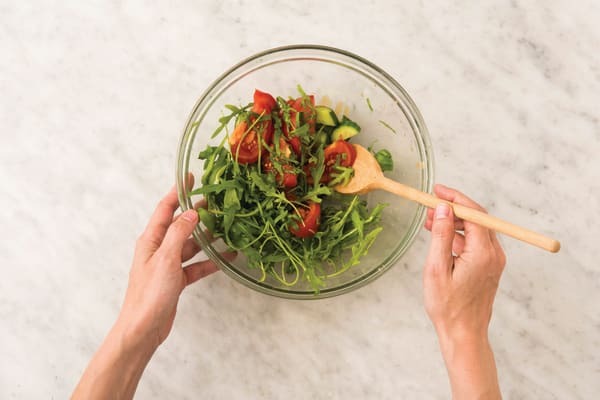 In a large bowl, combine the Dijon mustard, vinegar, sugar and olive oil (3 tsp for 2 people / 1 1/2 tbs for 4 people). Season with salt and pepper and mix well. Add the rocket leaves, tomato, cucumber and mint to the dressing. TIP: Toss just before serving to keep the leaves crisp. Place the plain flour and a pinch of pepper on a plate. Drain the haloumi and pat dry with paper towel. 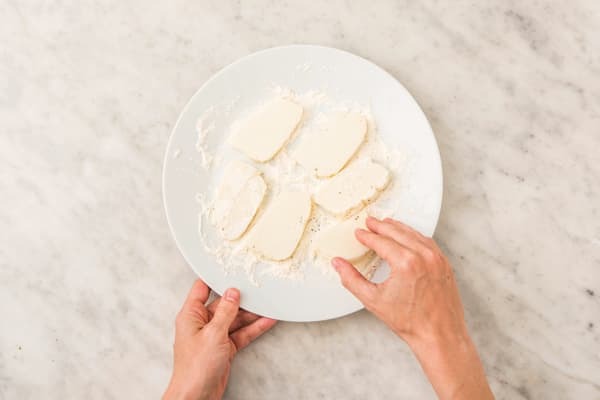 Place the haloumi on the plate and turn to coat. When the pumpkin has 5 minutes cook time remaining, heat a good drizzle of olive oil in a medium frying pan over a medium-high heat. When the oil is hot, add the coated haloumi and cook for 2 minutes on each side or until golden. Remove the pan from the heat, drizzle the honey over the haloumi and turn to coat. Add the pumpkin to the salad and toss to coat. 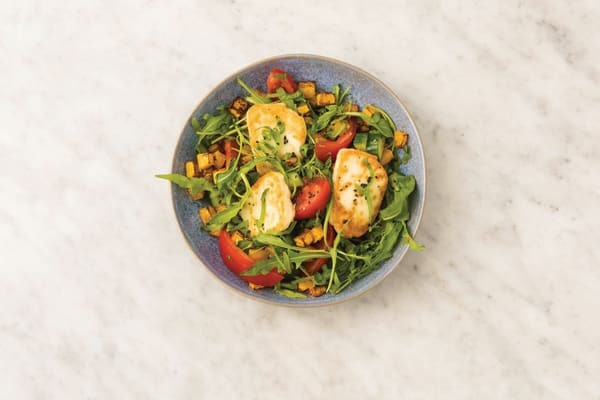 Divide the salad between bowls and top with the haloumi. Sprinkle with the black sesame seeds and reserved mint leaves. Drizzle over any remaining honey from the pan.